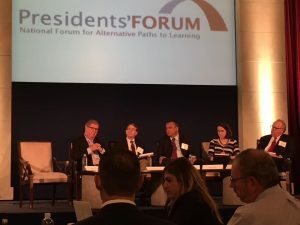 Measuring Progress: Catching Up With Innovation – the 13th Annual Presidents’ Forum - Wally Boston - American Public Education Inc. The Presidents’ Forum, established in 2004, is a collaboration of accredited, national, adult-serving institutions and programs that have embraced the power and potential of online education. The Forum provides a venue for leaders in higher education and stakeholders to share their knowledge and learn from others’ best practices. It was originally affiliated with Excelsior College and Excelsior’s president, John Ebersole, deserves credit for organizing and supporting it in its early years (note: I currently serve as Forum vice chair and APUS has supported the Forum for years). I served as moderator for the first panel, “HEA Reauthorization: Time to Catch Up with Innovation.” Panel members included: Dr. Chris Bustamante – president, Rio Salado College; Amy Jones – director of education and human services policy, House Committee on Education and the Workforce; Greg Ferenbach – special counsel, Cooley LLP; and Dr. Roger Sublet – president, Union Institute and University. Amy Jones noted that there is no chance that the Higher Education Act (HEA) will be reauthorized under this Congress and President Obama. 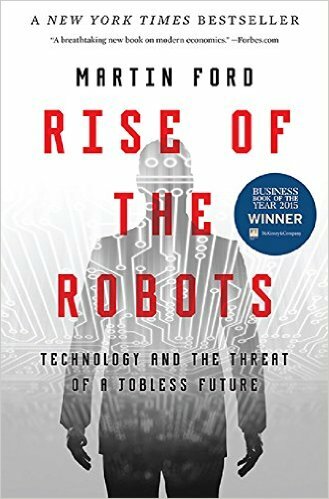 Regardless of the national election outcome, the House Committee on Education and the Workforce will change since Congressman Kline is retiring and no one has yet been named as his successor (note: an Oct. 20 Inside Higher Education article speculates that Congresswoman Virginia Foxx is the favorite). Ms. Jones stated that the House will hit the ground running next year utilizing the key principles from their white paper, “Strengthening America’s Higher Education System,” published last year. Those principles are to: ensure students are informed and institutions are transparent; simplify the student aid program; streamline repayment programs; ensure the future of Pell grants; improve access and completion for non-traditional students; improve IPEDS, enable innovations; and, lastly, ensure strong accountability in a limited federal role. Ms. Jones added that the House differs with the Senate regarding the “skin in the game” or risk management concept for institutions regarding student loan defaults. In addition, there are several House members concerned about citizen privacy who may continue to object to creating a unified student record, something that many in higher education favor. Dr. Chris Bustamante suggested that Pell Grant eligibility be extended to students participating in short-term education programs, particularly those focusing on the workforce such as many offered by community colleges like Rio Salado. He added that financial aid rules should be adjusted to the 21st century, instead of following rules designed for students attending college in the 1960s and 1970s. Dr. Bustamante stated that Rio Salado offers 48 semester starts each year and while that is allowable under a non-conforming academic year provision in the rules and regulations, the personnel cost at Rio to assure compliance is extensive. He favors the peer review accreditation process and recommended that Congress preserve its status and authorities in the next reauthorization. He also asked that Congress provide institutions more discretion in limiting the amount of money students are allowed to borrow for college. While only 19% of community college students nationally borrow money to attend, 40% of the Pell students attending Rio Salado borrow money even though Pell Grants cover the costs of tuition and fees (note: Dr. Bustamante’s point is not unique and is one that I support; many institutions charging low tuition would prefer to have a greater ability to limit the amount of money that students borrow). Dr. Bustamante also advocated for the establishment of a federal unit record data system so that institutions have access to data (alumni salaries, etc.) that would allow them to be more accountable to the public. While some may argue that the College Scorecard provides data on graduates’ earnings, it is limited to students who utilized federal aid programs and for community colleges and institutions like APUS that is a distinct minority of students who graduate. Lastly, he recommended the establishment of a minimum support amount that all states must contribute to cover their public institution costs. He suggested requiring all states to contribute a minimum to each institution as a percentage of total costs, i.e., 33%. Ideally, such a regulation would maintain college affordability in states that have continued to cut back college support in lieu of raising taxes. Dr. Roger Sublett provided a background of Union Institute, founded by 10 college presidents to serve adult learners. He suggested that Congress consider the importance of innovation over additional compliance and mentioned a research paper where the authors reported that the cost of federal compliance for colleges ranges from three to 11% of total expenses. 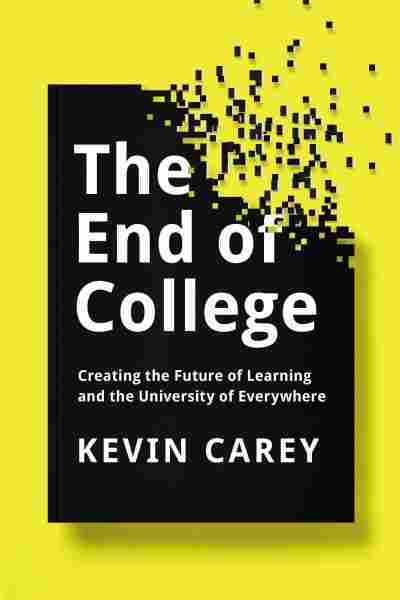 The authors extrapolated the total cost of compliance for all colleges and universities and determined it to be approximately $27 billion annually. Dr. Sublett also asked that new standards of student learning and outcomes be considered in addition to loan repayment rates, graduation rates, and jobs. He noted how flawed the IPEDS system is for reporting outcomes for non-traditional students and stated that 98% of Union students are not included in the IPEDS report because most of them are transfers. In fact, IPEDS reports Union’s current graduation rate based on the outcome of seven first-time, full-time students. Higher education needs members of Congress to work collaboratively, with bipartisan legislative goals and objectives. Dr. Sublett believes the current peer review process of accreditation should continue, and that Congress should avoid creating a related federal process. The Academy has focused on student outcomes for the past 30 years and Congress and ED should let them continue to focus on outcomes without prescribing new and restrictive practices. Lastly, Dr. Sublett asked that those members of Congress drafting the HEA reauthorization reexamine the credit hour as the standard for measuring outcomes. Greg Ferenbach mentioned in his opening statement that in addition to practicing education law, he had worked with Strayer University many years ago. He agreed with Dr. Sublett that IPEDS should be fixed. In addition, he mentioned that FERPA regulations outdate the invention of fax machines and email and need to be modified due to changes in technology enabling accidental disclosure of student information. Mr. Ferenbach stated that the change in student mix, shifting from a majority of 18- to 22-year-olds attending college full-time to a majority of non-traditional students attending part-time, calls for a major overhaul of Title IV regulations. The failure of the Obama administration and Congress to agree on an HEA reauthorization bill has resulted in two dozen rules packages, most of which avoided Congressional debate and deliberation. Some of those are unevenly applied to institutions, focusing instead on the administration’s agenda. Mr. Ferenbach stated that the most recent investments in education have occurred where there is less regulation (non-Title IV-related partnerships), noting the need for Congress and the White House to agree on a better regulatory balance in order to encourage innovation on a wider scale. The SARA (State Authorization Reciprocity Agreement) was cited as a project on which regulators and institutions partnered to create a less cumbersome regulatory structure enabling online programs to be offered across state lines. At the end of the session, I asked the panel members if they could ask for only one change in the HEA reauthorization, what would it be? Dr. Sublett responded that he would like to see financial aid simplified for the non-traditional student. Mr. Ferenbach stated that he would like to see new rules implemented to permit institutions to limit the amount of money students can borrow. Dr. Bustamante stated that he would like to see the states required to assume a minimum level of responsibility for operating public institutions similar to a percentage of costs they must cover. As in the past, the conference covered several topics relevant to institutions like APUS offering online courses and degree programs. Kudos to Tina Goodyear and Paul Shiffman, COO and CEO of the Presidents’ Forum, respectively, for another great conference.